Capsule Summary: An entire episode shown from the point of view of a soldier rushed to the 4077th for surgery after being wounded while on patrol. It’s hard to discuss this episode without talking about what an exceptional half-hour of television it is and how ambitious the cast and crew were to attempt it. 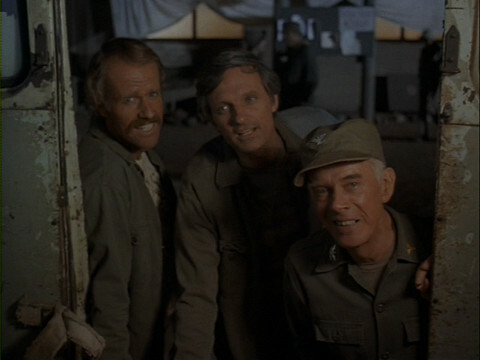 “Point of View” wasn’t the first time M*A*S*H pushed the boundaries of the traditional sitcom format. Earlier examples include “Hawkeye” and “The Interview” during Season 4. Likewise, “Point of View” wasn’t the last “high concept” episode. “Dreams” followed in Season 8, then “Life Time” and to a lesser degree “A War for All Seasons” in Season 9, plus “Follies of the Living–Concerns of the Dead” in Season 10. Out of all 251 episodes, I think it’s safe to say “Point of View” was the most challenging for the cast and crew. The story takes a backseat to the visuals but it’s simple and solid. Private Billy Rich is wounded while on patrol and, after being treated by a medic, is sent via chopper to the 4077th for surgery. He has shrapnel in his neck and requires a tracheostomy to insert a tube to help him breath. The surgery initially appears to have been a complete success but later Hawkeye and Charles are forced to perform a second, very tricky, surgery. Rich pulls through and is able to thank Hawkeye before leaving for Seoul and, eventually, a trip back home to Texas. There’s a minor B story involving Colonel Potter, who is acting angry and moody because he forgot to call Mildred on their anniversary. Rich is able to help by letting Hawkeye know why Potter is upset. Radar calls Mildred on Potter’s behalf and everything works out. The point of the episode is to allow the viewer to experience the 4077th through the eyes of a wounded soldier. The camera stands in for Private Rich, seeing everything he sees: the explosion that wounds him, the chopper ride to the 4077th, traveling via jeep from the chopper pad to pre-op, getting x-rayed, preparing for surgery, waking up in post-op, enjoying a sponge bath, visiting the Mess Tent, choking in post-op, going back in for surgery, waking up for a second time in post-op, and finally being loaded onto a bus. He then laughs and walks away. It’s a nice, human moment for Charles. B.J., Hawkeye, and Colonel Potter say goodbye to Private Rich. So much credit for the success of the episode goes to director, Charles Dubin. And remember, he had only three days to film this, not three weeks…or months. And this was 1978, before steady cams. I think D. W. Griffith used this camera to shoot BIRTH OF A NATION. It couldn’t have been heavier or more unwieldy. Levine recalls how horrified he was when he first watched the episode in a screening room. Radar’s head filled the screen. It was gigantic. Later, when the episode aired on CBS, he decided Radar’s head didn’t look quite as humongous on a small TV set. It won none of them. According to the letter Private Rich is writing in post-op, most of this episode takes place on September 12th, 1951. The chopper ride provides a wonderful look at the 4077th. While I do like this episode for how creative and inventive it is, I feel like it would have been slightly more authentic if it lacked the cinematic effects, such as cuts and dissolves . . . but then again, I know that would be impossible, because if the camera rolled the entire time without such, we’d see film crew and equipment in the shots, and that would break the reality of the episode. But I mean it bothers me in Post-Op when Rich is writing on his pad, then when Hawkeye walks in and sits down, we cut to a tighter shot of the pad where the handwriting is different. Not to mention the voice of Rich sounded suspiciously similar to the camp announcer (which I’m pretty sure it was). And I know he had a throat injury but was it really necessary to make him sound like ET? I’ve always felt that this episode should have been an hour so they could show more. Then again, if it was then whenever it’s shown it’d be cut into 2 parts and wouldn’t seem real. One thing I just noticed..after the bit about”everyone should have a chart” Hawkeye quickly wipes his nose with the same finger he (out of camera range) uses to block off Rich’s breathing tube. The look on the face of the guy who first comes up to see if Rich is alright was very realistic. He comes up looking all hopeful and sees the wound and his face completely changes. Very good acting from a guy who is only in it for a minute. The only thing that bothers me is the Potter storyline-he’s angry about being away from Mildred (again) and it seems unlikely that he’d talk about his problems with a wounded private whom he didn’t know. The episode is technically brilliant, although the camera work might look odd and somewhat unconvincing to modern viewers used to steadicams.